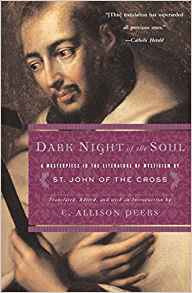 This new edition of the Image classic, with more than 100,000 copies sold, brings E. Allison Peers's magnificent translation of St. John of the Cross's masterpiece Dark Night of the Soul to a new generation of readers and will renew the interest of those already familiar with its soaring poetry and timeless truths. The sixteenth-century Carmelite monk St. John of the Cross stands alongside St. Teresa of Avila as the West's best known and most beloved Christian mystic. As Peers writes in the Introduction to his definitive translation of Dark Night of the Soul, "The most sublime of all Spanish mystics, he soars aloft on the wings of Divine love to heights known hardly to any of them... True to the character of his thought, his style is always forceful and energetic."